BH-Motors want to make sure you drive safely this spring, that’s why we have put together a fantastic offer to ensure you remain safe but also receive excellent value for money! 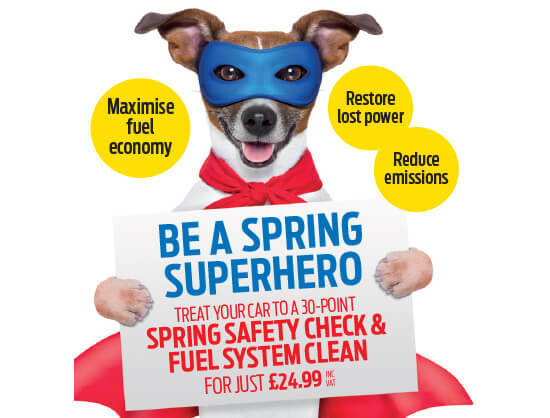 For just £24.99 our trained technicians will carry out a thorough 30 POINT SPRING SAFETY CHECK and FUEL SYSTEM CLEAN. We’ll check essential components, top up fluids and carry out the fuel system clean, all to ensure your safety and smooth-running. The fuel system clean benefits the engine without harming exhaust treatment systems or filters and is used and recommended by car manufacturers, mechanics and motorists worldwide. Techron fuel system cleaner by Texaco can improve start-up and acceleration, maximise fuel efficiency and reduce vehicle emissions. Available for petrol, petrol-electric hybrid and diesel engines. *Fluid levels will be topped up to the vehicle’s manufacturer recommended levels and are limited to ½ litre per item. Offer valid until 30th June 2019. At BH Motors we pride ourselves on being open to all enquiries, requests and orders as often as we can. Contact our Malvern dealership now; even if we cannot respond right away, we promise to get back in touch very quickly.